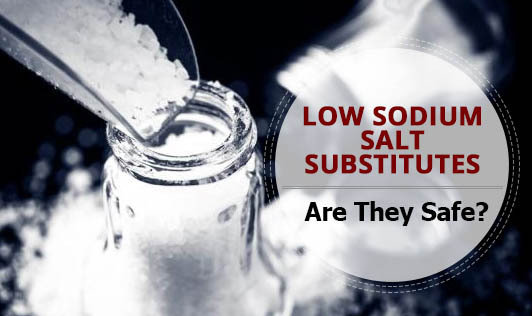 Low Sodium Salt Substitutes - Are They Safe? Low sodium salts have become very popular these days. Everyone is talking about it, especially those with hypertension/high blood pressure and those who prefer to use it instead of reducing their salt intake. The first instruction doctors and dietitians give to a person with hypertension is to reduce their sodium intake, which in turn means reducing their salt intake. Using low sodium salt instead of compromising on taste makes perfect sense, right? Well, not really! Salt used for cooking is made of Sodium chloride, so if you remove sodium from salt, it is not really salt! So how do manufacturers manage to produce low sodium salt? It's simple. They replace a certain percentage of Sodium chloride with Potassium chloride which reduces the sodium content of salt. Potassium chloride tastes a lot like salt but may leave a bitter after taste. Though this may be a better option to cut down on salt intake, excess of Potassium chloride in the body can be lethal. Here's what you should know about the excess potassium from these low sodium salt substitutes. In people who have kidney problems, the potassium may start getting accumulated as the kidneys will not be able to remove the potassium. Certain medications like diuretics and other hypertension medications tend to retain potassium in the body. Along with those medications, if a person takes low-sodium salt substitutes regularly, the potassium levels in the body will spike up. The symptoms of elevated potassium levels include nausea, diarrhea, mild tingling in hands and feet and irregular heartbeat. Herbs, spices and other herb seasonings can be used as a substitute for salt. Check the ingredient list before buying low-sodium salt to ensure that there is no potassium chloride and talk to your doctor before using salt substitutes.